On 23 June 2013, ASIC released Consultation Paper 212 Licensing: Training of financial product advisers - Updates to RG 146 (CP 212). CP 212 proposes increasing training standards for persons who provide financial product advice by introducing 2 new training regimes. These are proposed to come into effect in 2015 and 2019 respectively. Submissions to ASIC in relation to CP 212 close on 30 September 2013. As part of the consultation process, ASIC is also seeking feedback on the timeframe for implementing the proposed new training standards. On 24 June 2013 the Australian Securities and Investments Commission (ASIC) proposed an increase in the knowledge and skill requirements for financial planners - and other persons holding an Australian financial services (AFS) licence - by the release of Consultation Paper 212 Licensing: Training of financial product advisers - Updates to RG 146 (CP 212). Will CP 212 apply to the new limited AFS licence? Yes: holders of a new limited AFS licence will be required to meet all relevant training requirements set out in CP 212 if ASIC ultimately adopts those requirements. Accordingly, the changes will be relevant to all AFS licensees who advise retail clients. The first article discusses the new regulations and can be viewed here. The second article discusses ASIC's guidance on the new limited AFS licence and can be viewed here. Both articles discuss the appeal of these limited licences to accountants who advise in relation to superannuation and a limited range of other financial products. Currently the training standards and skill requirements for AFS licensees and representatives who provide financial product advice to retail clients are prescribed by Regulatory Guide 146 Licensing: Training of financial product advisers (RG 146). All advisers must comply with these training standards unless they fall within certain limited exceptions. Under RG 146, training standards and skill requirements vary depending on the services provided by the adviser, for example, whether the adviser provides personal or general advice and whether they advise on Tier 1 financial products (all financial products except Tier 2) or Tier 2 (basic banking products and non-cash payment products). meeting annual continuing education requirements. 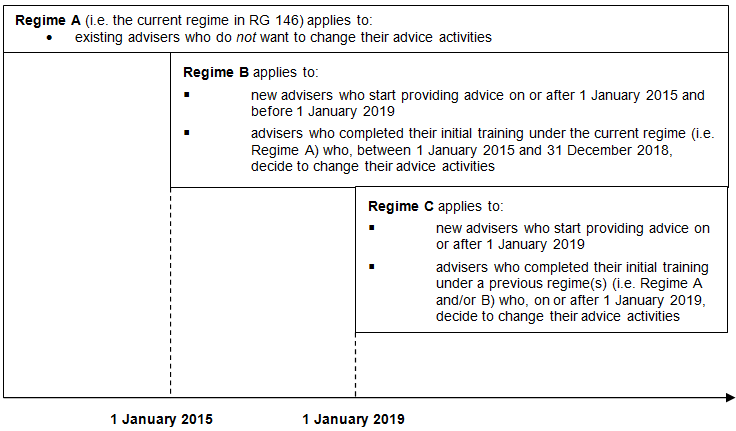 CP 212 proposes changes to the training standards that are set out in RG 146 by increasing the knowledge and skill requirements for AFS licencees (see Regime B and Regime C below). RG 146 proposes an increase in generic knowledge requirements, specialist knowledge requirements for financial planning, securities and superannuation, and the requirements for licencees' educational level. CP 212 will affect any person who intends to start providing financial advice in the future or any person who is looking to change their advice activities. change from advising on Tier 2 products to advising on Tier 1 products. For more information, contact Maddocks on (03) 9288 0555 and ask to speak to a member of the Superannuation and Financial Services team or the General Commercial team.